Shuvalov Palace is one of the noble palaces situated on the embankment of the Fountain River. It was built at the end of the 18 century and belonged to the duke Voronzov. Unfortunately he died before the construction of the palace was finished. After the construction his wife with children lived here for some time. Then the palace was sold to the Naryshkin family. It became the center of St. Petersburg society. That time its ballroom was the biggest among all noble palaces. The most famous ball was dedicated to the celebration of the tsarevich Alexander’s (future Alexander II) birthday. He reached the age of 16. In the middle of the 19 century the palace underwent serious renovation for the wedding of Sofia Naryshkina to count Pyotr Shuvalov. From that time the palace was known as Naryshkin-Shuvalov Palace. During the 20th century the palace passed through a lot. During WWI the rooms of the palace were used as a military hospital. After Communists revolution of 1917 the palace was nationalized. From 1919 to 1925 it housed the museum of Aristocratic life. Then the print house was here. During the Siege of Leningrad the palace like other buildings in the city suffered a lot. After the war it was renovated. From 1969 till 2000 here was the house of Friendship. During almost 30 years the place was in need of proper restoration. It got it from 2006 to 2013. In November of 2013 it open it doors as a museum to new visitors. 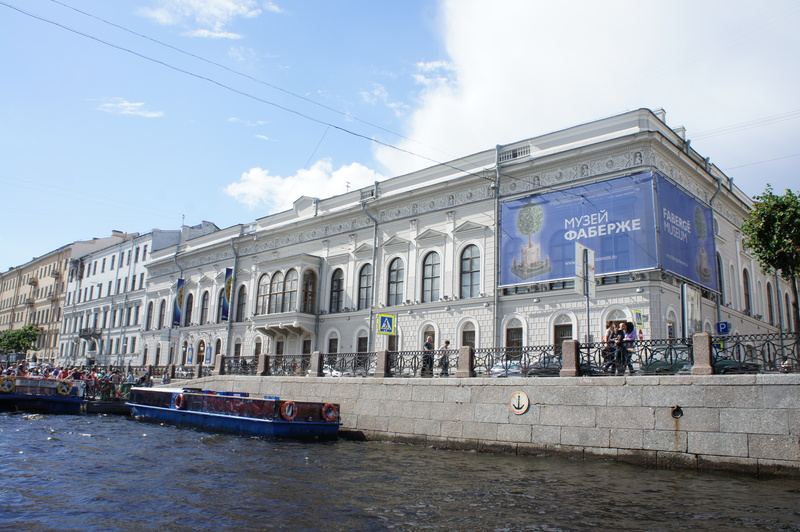 The palace houses one of the new and popular museums of St. Petersburg – Faberge museum. The museum is unique not only thanks to the biggest collection of Faberge works but also because most of these works are on the display in the museum.